Last season signalled the end of an era for several Bayern Munich stars, but the champions have since manoeuvred shrewdly to keep their ship steaming toward future success. As transitions go, it’s a case of so far, so smooth for the current Bundesliga champions. 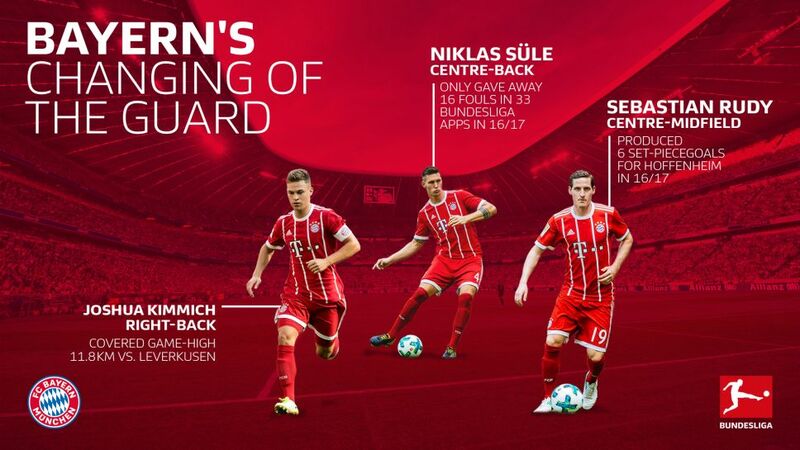 A bold new beginning at the Allianz Arena has brought Sebastian Rudy and Joshua Kimmich to the fore where once legends Philipp Lahm and Xabi Alonso soared. And with colossal defender Niklas Süle looking astonishingly assured on his Bayern bow, the Bavarian giants are already striking a formidable bond at the start of the new season. Rightly remembered as footballing gods, Lahm and Alonso were deemed by many as irreplaceable, not only in coach Carlo Ancelotti’s line-up, but to the wider footballing world. Many a sombre Bayern fan said a sad farewell to two of the game's most gifted – and humble – protagonists following last May’s top-flight title celebrations in Munich. Yet when newly arrived midfield menace Rudy floated a free-kick toward debutant Süle to score the season opener against Bayer Leverkusen after just nine minutes last Friday night, the feeling of a fresh new start swept through the champions. "We had a warm welcome and felt at ease from the beginning. It's easy to perform well then," Rudy – who provided six such assists from set-pieces for former side Hoffenheim last season – told Bayern’s official website. "I was very pleased to make my first Bundesliga appearance for Bayern, win and set up the first goal. I'm fired up for more," the 27-year-old midfielder warned. Along with Süle and Kimmich, the former Stuttgart schemer Rudy was a scintillating presence for Germany during this summer’s Confederations Cup triumph and has since slotted perfectly into Alonso’s role at Bayern – featuring in their Supercup triumph and DFB Cup first-round win this term as well as Friday’s 3-1 Bundesliga victory against Die Werkself. As well as regularly picking out team-mates in threatening positions, Rudy also aided in breaking up opposition attacks, something the Baden-Württemberg-born midfielder did regularly at Hoffenheim, where he won an average 53 per cent of his duels in 2016/17. As impressive a percentage as Rudy's is, it’s dwarfed by Kimmich’s awesome duel-winning rate of 89 per cent in last Friday’s Bundesliga curtain raiser, where the 22-year-old filled Lahm’s significant void with aplomb. Claiming that Bayern were, “knocked out of our stride a bit,” by the arrival of a thunderstorm during the encounter, Kimmich rarely put a foot wrong when covering a game-high 11.8km [almost keeping up with his average of 12.3km per game last term]. Plus, it was the Germany international’s corner that led – via Arturo Vidal – to Bayern’s second goal, the impressive Corentin Tolisso netting on his Bundesliga bow. Despite playing under former coach Pep Guardiola as a central defender and subsequently used as a midfielder during the majority of his 15 Bundesliga starts under Ancelotti last year, Kimmich is now primed to excel where Lahm once thrived. Yet as good as it got on Friday for the team that lifted the Meisterschale a for a fifth successive time last term, there are – insists new recruit Süle – areas to improve. “It wasn't easy,” the ex-Hoffenheim defender insisted after a game in which Robert Lewandowski also netted for the hosts. His confessed idol Jerome Boateng missing through injury, along with Javi Martínez, and fellow centre-back Mats Hummels leaving the field against Leverkusen with a stomach complaint, Süle was at one stage the only recognised central defender on the pitch for the hosts. For the champions, the important goal of replacing those who helped to produce recent glories is showing promising signs of having already been achieved.